Another attempt. Yay! Right?! Yay? What do you guys think? I’m not too great at these, admittedly. 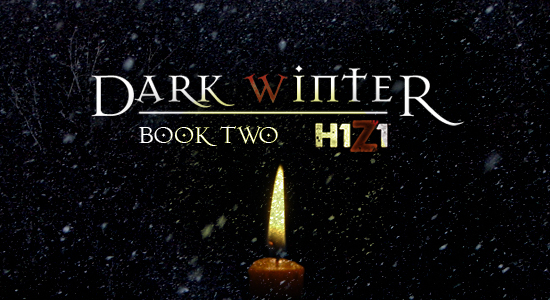 This entry was posted in Dark Winter, Fan Fiction and tagged Dark Winter, H1Z1, SOE. Bookmark the permalink. I think it’s fantastic. The single candle and the hints of tree branches give it a desolate feel, which the candle itself counteracts somewhat by adding the yellow. I really like the glow’s spread to the words. It manages to pull off evocative while staying pretty simple. Thanks! Yeah, I’m pretty happy with how this turned out. I was a little worried it would feel cliche or something, but it came out nice.